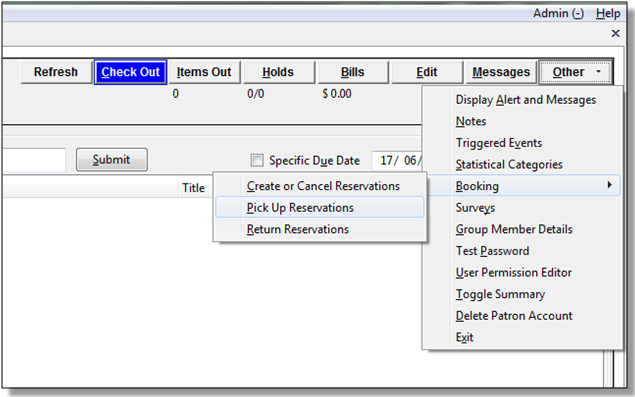 Always use the dedicated Booking Module interfaces for tasks related to reservations. Items that have been captured for a reservation cannot be checked out using the Check Out interface, even if the patron is the reservation recipient. 1) Ready-for-pickup reservations can be listed from Other -→ Booking -→ Pick Up Reservations within a patron record or Booking -→ Pick Up Reservations. 2) Scan the patron barcode if using Booking -→ Pick Up Reservations. 3) The reservation(s) available for pickup will display. Select those you want to pick up and click Pick Up. 4) The screen will refresh to show that the patron has picked up the reservation(s).